It's no secret i'm a huge Daredevil fan, and a Punisher fan too, so instead of picking one of them for this week, I thought a Punisher vs Daredevil mini-series would be a project i'd love to draw for Marvel. Something like 'Daredevil is on the run from the relentless hunter that is the Punisher'. The characters do not like each other, so I think there's a lot of conflict that could arise. Of course, it's probably been done a million times before, but dammit: ***I*** want to do it. Ideally; written by Garth Ennis and coloured by Matt Hollingsworth! But hell: Fellow Twart Nathan Fairbain did a fantastic job colouring this piece, so i'd gladly take him and *anyone* who would write it. You can see the black-and-white version I did on my own blog. Nathan did an amazing job on this!!! I've known Matt a while so i'm hoping to one day take all the drinking stories i've gathered over the years and blackmailing him into colouring something for me. Dec, this is frigging awesome. 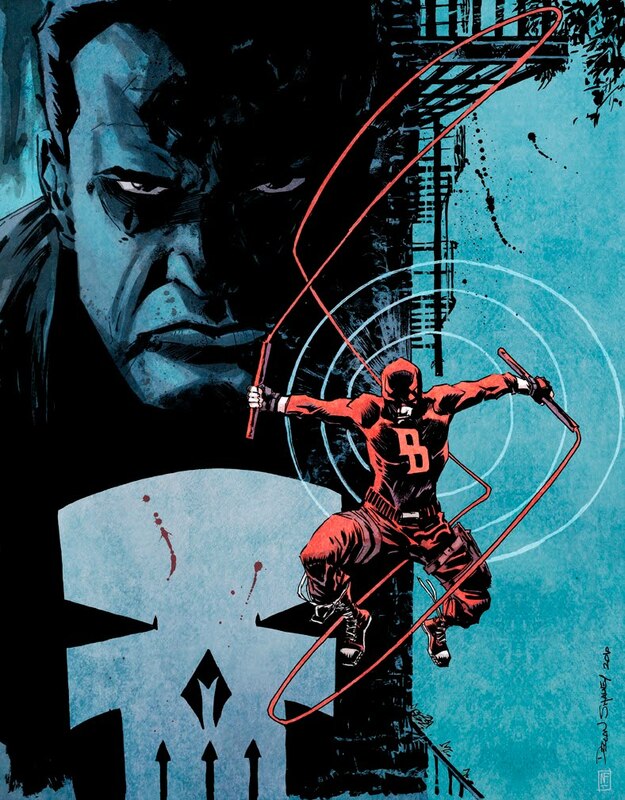 Your Punisher is great, but I bloody LOVE your Daredevil. Smartest thing about the redesign - the subtle boxing motif in the gloves, shoes and baggy trews. Cool. I want this book NOW! I always love your take on Daredevil and Nathan did a bang up job on the colors - making your incredibly strong image even stronger. Great job, guys! The Punisher is one of my all time favourite Marvel characters, brilliant colouring! Punisher is cool but no love for Black Widow? Love that DD! Man, this IS the book for you! I'll chime in with the chorus here, Dec, Daredevil is a perfect fit for you and this is proof. The Punisher has only beaten DD once. Just kickass, Dec and Nathan. Marvel needs to make this book. Thanks so much guys; glad ye all like it! i really hope (and trust) that your trajectory at marvel stays on it's present course so i can see this book happen, dec.